Since I've made some changes to my Deathwing army list, I thought I might post what they look like now. It's not a "legal" list by any stretch of the imagination, but it's what I'm using these days. The army breaks down like this. I decided to keep this guy and rework his painting a little bit after learning a few things painting the Scouts. I dropped Belial in favor of this guy because he adds a bit more than Belial does. I've been unable to get either one to do anything worthwhile on the battlefield, but I think the blue paintjob on this guy looks pretty cool. That and I love his shoulder artwork. So he's in, Belial is out. 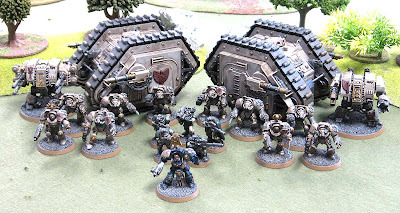 Terminator squads still counts As Troops though. In anticipation of the upcoming Codex, I've decided to add some options I think would do these guys good. Namely, combi-plasmas for the Sergeants. I absolutely love the way these weapons look and have been waiting forever to add them to a couple models. Right now, I only have one heavy weapon in the squads, but I'm contemplating adding a second one. It would be another heavy flamer I think. That would be kinda cool. Yep, these guys are part of my Troops too. I'm not using the Dark Angels Scouts rules, but Space Marine Codex rules for these guys. Lots more options and versatility for the same points. Sure, their stats aren't as good and Dark Angel Scouts, but that's the trade off for using them I suppose. Old schoool models, a must use. I did some work for these and cleaned them up a bit to get them useable. Sure, they only hold 5 guys, but how cool looking are these things? I want to add multimeltas to these if have a couple points left over. That means I'll have to use Forge World rules for them though, but that's not big deal. I've got one Mortis Pattern dread with dual Autocannons (uses Forge World rules) and one "regular" dread with a Close Combat Weapon and a Lascannon. This guy used to be a Mortis pattern as well, but I put the fist back on him since I wanted something that could run along with a Terminator squad and crush things if need be. And that's where I stand now. I'll need to get some test games in with it before heading to Games Day in August. It's only 1500 points, but that's what I prefer to play. I suppose I could add another Terminator Squad to get it up to 1750. If I did, I would definitely give them all Thunderhammers and Storm Shields. I've always wanted a squad outfitted like that. Given that you're already pretty much making up as you go along already (Terminators as Troops w/o Belial, for example), I don't think you need to get too hung up on whether or not you're allowed to put Multimeltas on your Land Raiders. I'm a little confused. What codex are you using for these guys? I thought to make Termies count as troops you needed Belial? He's not. Or, if you had to put a name to it, he's using "an unwritten homebrew codex," which is fine between friends and for casual play. Rushputin: Good point. No need to split hairs at this point. Jacob: I'm using the Dark Angels Codex... kinda. Fritz: I'll definitely look for you there, that's for sure. In anticipation of the new codex? Know something we don't, Ron? Nope, just wishful thinking on my part. I'll join you on that wishful thinking, my Deathwing aren't going to see a game until a new 'dex arrives. Squats will get a codex before Dark Angels do! If the toy in particular I'm watching at my local toy store goes into the discount price bin, I might be tempted to pick them up and then I'd have the start of my Squat army. Ron: Those old Land Raider models are looking ace. Those are new lascannon and HB bits though, right? Ron you mean they haven't put those 28mm scale Drop-Bears on sale yet?!? Seriously though, if the DA ever got a properly re-worked dex I might actually paint the DA termis I have in the bits box. For now they stay in storage. Wait, what upcoming codex?! Do you know something we don't?! Don't toy with my feelings, here man! Nevermind, I read the earlier comments....something inside me wept a little, lol. Sgt. Sorry about that. If I knew something, I would certainly share it with the rest of you all. In all honesty, I don't suspect we'll be seeing a new Codex anytime soon unfortunately. Ron, as soon as I can get good pics, I'll send you some of my Ultra-wing, which is now around 3000 pts. From the advice on your site and a few others that you link to, I'm now 3-3-1 with my Ultrawing. I took 3 straight losses in a tourney, but they were all learning games. Thanks for the list help earlier!! Danny: You're welcome, glad it helped.